Description: The trail was constructed in 2006 as a connector from the Tollgate Community to the Middle and High Schools. The trail consists of a compacted gravel/bentonite mix, approximately 8 feet in width and moderately flat. The trail meanders through the Trout Creek Conservation area, managed by the Deschutes Basin Land Trust and the Sisters School District, located between the High School and Tollgate. Access: Access is provided from the south end of the Tollgate Community and the east parking lot of the Sisters High School (near the track). Length: Approx 25 miles of trails Surface: Mostly dirt single track with some FS road. Description: The Peterson Ridge Trail was constructed in 1989 as a mountain bike trail and consists of a combination of single track trail and old forest service road. The bike trail system has undergone a major expansion in 2008 with nearly 20 miles of new trails. The trail is generally easy with moderate difficulty sections in some locations and gains elevation as it heads south. The Eagle Rock Loop portion of the trail is approximately 5.5 miles. The trail generally consists of west and east legs, with connector trails in between. Permanent signs on 6x6 posts have been placed at all major intersections, and correlate with the trail map. A single track trail at the south end connects to Three Creek Road. Access: The main trail head is located approximately ½-mile south of downtown Sisters just south of the Whychus Creek bridge (parking is limited at this location). Many users park at Village Green Park where ample parking and restrooms are available. Additional access is also provided at the south end of the trail just past mile marker 5 on Three Creek Road as well as where the trail crosses the Mainline and Peterson Ridge Roads (parking limited at these locations). Additional Notes: The lower portion (near town) is heavily used by walkers, joggers, hikers, and dog walkers. Bicyclists are to use caution while riding this trail for the safety of all. Length: Approx 0.6 miles Surface: Dirt single track and FS road. Description: The Five Pine Campus and Sisters Athletic Club are located on Hwy 20 at the east edge of Sisters. The connector trail consists of single track dirt and old FS road and connects into the Peterson Ridge Trail at approximately 0.3 miles from the trail head. Access: The trail head is located at a trail kiosk which is located south of the Sisters Athletic Club within the Five Pines Campus. Length: Approx 6.6 miles Surface: Dirt single track and FS road. Description: The Sisters Tie trail connects the City of Sisters with Indian Ford Campground. The Metolius/Windigo Trail (across highway 20), the Black Butte Loop Trails, and the Suttle Lake Tie Trail also connect to Indian Ford Campground. Starting from Sisters, the first several miles of the trail consists of a combination of single track and old FS road. At about the halfway point, the trail converts to predominately single track trail. The trail is generally flat. Access: Trail heads are located on Pine Street approximately ½ mile north of Sisters and near Campsite 12 within the Indian Ford Campground. Additional access is available near the gravel pit and connector trail to Three Creek Road (north end of Pine Street). Length: Approx 12 miles (between connectors) Surface: Mostly dirt single track with some dirt FS road. Description: The Metolius/Windigo Tie trail extends from the Head of the Metolius south into southern Oregon. 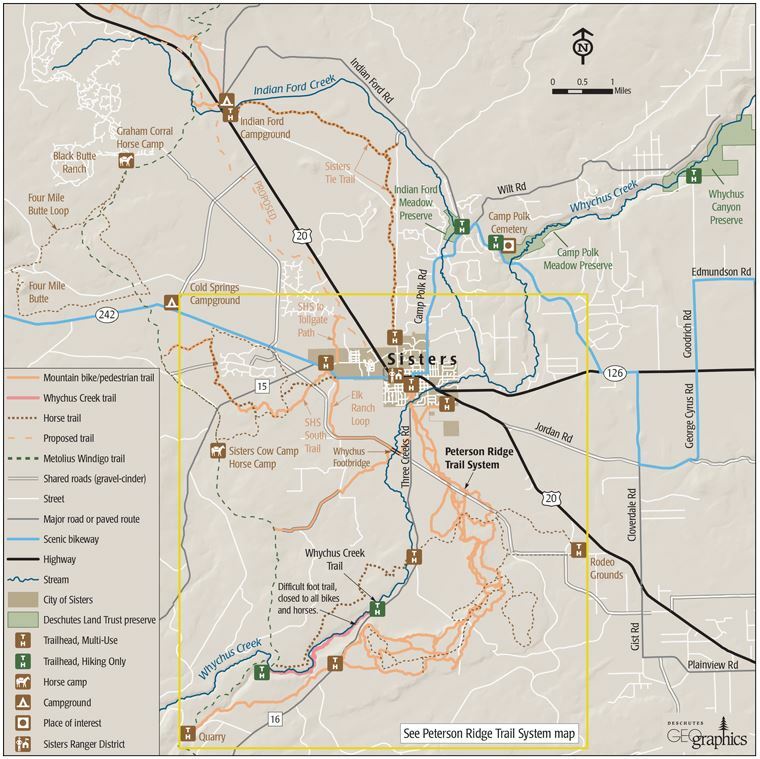 This +100-mile National Recreation trail begins near the Metolius River headwaters west of Sisters and runs south to Windigo Pass near Crescent Lake. The trail was created around 1980 by linking sections of existing trails, primarily to serve long-distance horse riders seeking an alternative to the Pacific Crest Trail (#2000) (PCT). The trail is a USFS designated trail, and while not part of the official Sisters Community Trail system, is used regularly by trail enthusiasts. The trail is predominately single track dirt trail with moderate elevation change. It is heavily used by horse riders during the spring to fall period, and thus becomes unsuitable for mountain biking in places during the summer and fall months. Access: Access to the trail is general via connector trails or at Highway 20 (west of Indian Ford Campground, and Graham Corral (horse staging area), and Cow Camp (horse staging area). Length: Approx 7.6 miles Surface: Old USFS dirt road and trails. Access: Access is generally from Harrington Loop, Gist Road and the Mainline Road.